By Lily of Lily Glass Photography. Catch her Mother’s Day Special right here! Family photos. Just the mention of it can cause your heart to race and your mind to spin. We all want lovely images of our family laughing and playing peacefully together, but is it really possible to get those pictures without threatening “stand still or no ice cream” through gritted teeth? As someone who gets to capture these moments, I assure you, it is. 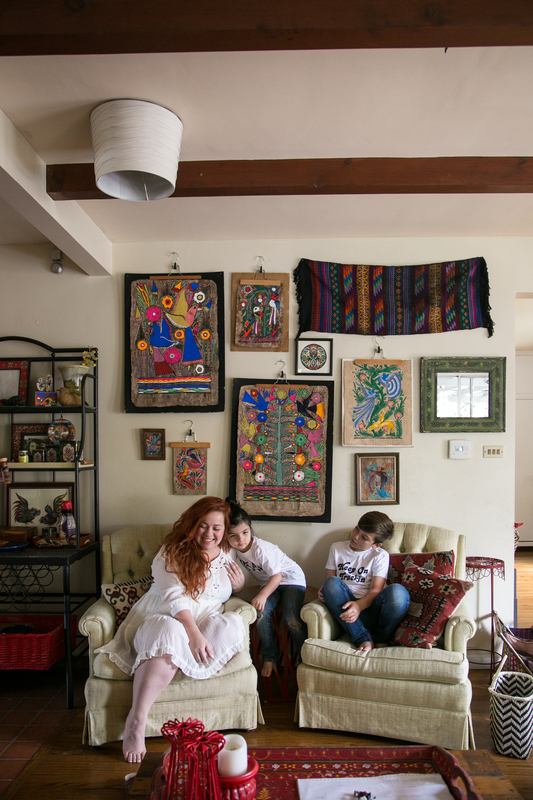 And my favorite place to photograph a family is in their home. I know what you’re thinking: it’s hard enough to get the entire family ready by a certain time not to mention clean my house! But it’s within that space that your love has grown. Where the hard work is done. Where you argue and makeup and teach and gently guide and snuggle and wipe noses. It’s the everyday love that I want to remember as a mother and so as a photographer, it is hands down my favorite thing to document for other families. So today I’ll be sharing a few tips to keep in mind when having portraits taken inside your home while maybe even enjoying the process. 1. Dress mom first. Choose something comfortable that makes you feel confident. Then coordinate the little one’s outfits and lastly dad. Keep things casual like it’s a day in your home and try to avoid that matchy-matchy look. 2. Embrace the chaos. At some point a bed is going to be ruffled and the lego bin tipped over. Let it happen. Heck, be the one to make it happen! People live here, remember? 4. Trust your photographer. I know that when I ask you to sit on the couch the only thing you’re thinking about is that dying plant in the corner. I see it. And I chose this spot because the light is extra magical. Choose a photographer that is experienced in this kind of portraiture and you’ll feel more relaxed in the confidence that they want to capture your family in it’s best light (quite literally). 5. Have a few activities in your back pocket. Nothing over the top — a run through the sprinkler in the backyard or a few minutes baking together in the kitchen can add variety to your photos and document some of your favorite family activities. Thanks so much, Lily! Aren’t these great tips? Find more Lily Glass Inspiration via Facebook, Instagram and Pinterest!